Sewer line problems are more common than you may think, but that doesn’t mean you should wait to have it inspected and fixed. For Silver Spring homeowners, it’s important to know the basics of how a sewer line works and what some of the problems a sewer line may face. Learn more in today’s blog. Sewer line problems can quickly cause a huge headache. Sewer lines serve as a transport for wastewater from your home to underground sewer mains. Everything may seem to be fine with your sewer line, but a sewer line clog could quickly change all of that. You see, a sewer line clog leads to raw sewage backup coming out of your drains. This can lead to significant damage to your home and require an expensive sewer line replacement. The key is to respond to early warning signs before little issues turn into big problems. Tree roots are the most common cause of sewer line problems. There’s not a lot that can be done about this, but it’s important to pay attention to early warning signs before the roots cause total chaos. You can tell if you have a sewer line problem if water is backup up out of drains or the toilet and if you constantly hear a gurgling sound coming from the drains. The tree roots generally affect older homes the most. The most common cause of clogs in sewer lines for newer homes are feminine hygiene products, paper towels and thick toilet paper. Never flush anything other than toilet paper down your toilet so as to avoid expensive sewer line problems. Even if you’re an avid do-it-yourselfer and plan on undertaking most of the work yourself it is still important to bring in an expert for some of the tougher jobs. 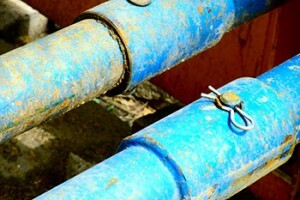 You should hire an experienced plumber to help fix any sewer line problems. Need an expert to fix your plumbing issues? Give Master Plumbing & Mechanical a call at 301-650-9100 and let our experienced plumbers get the job done right. This entry was posted on Thursday, October 22nd, 2015 at 1:23 pm. Both comments and pings are currently closed.